The Copenhagen edition of the Subsurface Hackathon is over! 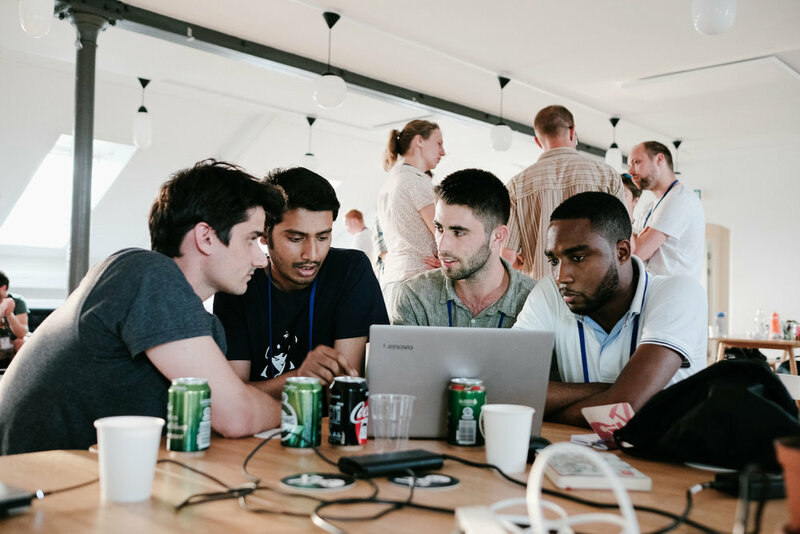 For three days during the warmest June in Denmark for over 100 years, 63 geoscientists and programmers cooked up hot code in the Rainmaking Loft, one of the coolest, and warmest, coworking spaces you've ever seen. As always, every one of the participants brought their A game, and the weekend flew by in a blur of creativity, coffee, and collaboration. And croissants. Pierre enjoying the Meta AR headset that DEll EMC provided. Our sponsors have always been unusually helpful and inspiring, pushing us to get more audacious, but this year they were exceptionally engaged and proactive. Dell EMC, in the form of David and Keith, provided some fantastic tech for the teams to explore; Total supported Agile throughout the organization phase, and Wintershall kindly arranged for the event to be captured on film — something I hope to be able to share soon. See below for the full credit roll! David Holmes of Dell EMC for unparallelled awesomeness. ...and also Arnaud Rodde for helping with the judging. The Wintershall team, especially Andreas Beha, who also acted as a judge. Brendon Hall of Enthought for sponsoring the event. Carlos Castro and Kim Saabye Pedersen of Amazon AWS. Mathias Hummel and Mahendra Roopa of NVIDIA. Eirik Larsen of Earth Science Analytics for sponsoring the event and helping with the judging. Duncan Irving of Teradata for sponsoring, and sorting out the T-shirts. Monica Beech of Ikon Science for participating in the judging. Matthias Hartung of Target for acting as a judge again. Oliver Ranneries, plus Nina and Eva of Rainmaking Loft. Christopher Backholm for taking such great photographs. 15 students plus a handful of post-docs. 19 people from petroleum companies. 20 people from service and technology companies, including 7 from GiGa-infosystems! 1 no-show, which I think is a new record. I will write a summary of all the projects in a couple of weeks when I've caught my breath. In the meantime, you can read a bit about them on our new events portal. We'll be steadily improving this new tool over the coming weeks and months. That's it for another year... except we'll be back in Europe before the end of the year. There's the FORCE Hackathon in Stavanger in September, then in November we'll be in Aberdeen and London running some events with the Oil and Gas Authority. If you want some machine learning fun, or are looking for a new challenge, please come along! 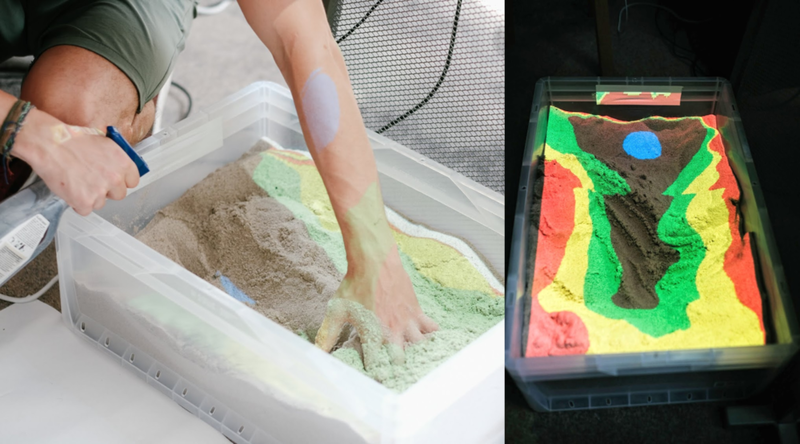 Simon Virgo (centre) and his colleagues in Aachen built an augmented reality sandbox, powered by their research group's software, Gempy. He brought it along and three teams attempted projects based on the technology. Above, some of the participants are having a scrum meeting to keep their project on track. It's not very glamorous, but sometimes you just want to plot a SEG-Y file. That's why we crafted seisplot. OK, that's why we cobbled seisplot together out of various scripts and functions we had lying around, after a couple of years of blog posts and Leading Edge tutorials and the like. Isn't that... reassuring? In this age of iOS and Android and Oculus Rift... there's still the command line interface. 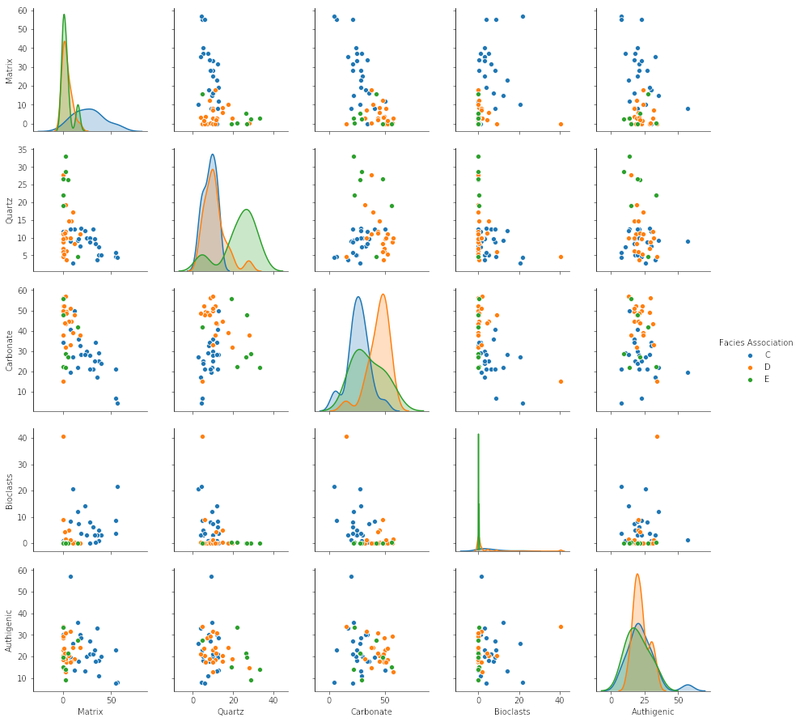 Make wiggle traces or variable density plots... or don't choose — do both! If you want, the script will descend into subdirectories and make plots for every SEG-Y file it finds. There are plenty of colourmaps to choose from, or if you're insane you can make your own. You can make PNGs, JPGs, SVGs or PDFs. But not CGM, sorry about that. Well, I say 'selling points', but the tool is 100% free. We think this is a fair price. It's also open source of course, so please — seriously, please — improve the source code, then share it with the world! The code is in GitHub, natch. The 2D seismic line in this post is from the USGS NPRA Seismic Data Archive, and are in the public domain. This is line number 31-81-PR (links directly to SEG-Y file). My recent post on multi-attribute data visualization painted two seismic attributes from on a timeslice. Let's look now at corendering attributes extracted on a seismic horizon. I'll reproduce the example Matt gave in his post on colouring maps. Data that varies relatively gradually across the canvas — e.g. elevation here — should use a colour scale that varies monotonically in hue and luminance, e.g. 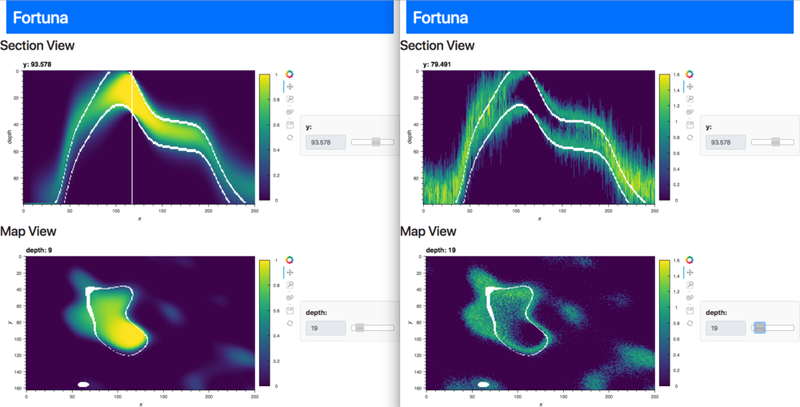 CubeHelix or Matteo Niccoli's colourmaps. Data that varies relatively quickly across the canvas — e.g. my similarity data, (a member of the family that includes coherence, semblance, and so on) — should use a monochromatic colour scale, e.g. black–white. If we've chosen our colourmaps wisely, there should be some unused hues for rendering other additional attributes. In this case, there are no red hues in the elevation colourmap, so we can map redness to instantaneous amplitude. Without wanting to get too gimmicky, we can sometimes enliven the appearance of an attribute, accentuating its texture, by simulating a bumpy surface and shining a virtual light onto it. This isn't the same as casting a light source on the composite display. We can make our light source act on only one of our attributes and leave the others unchanged. 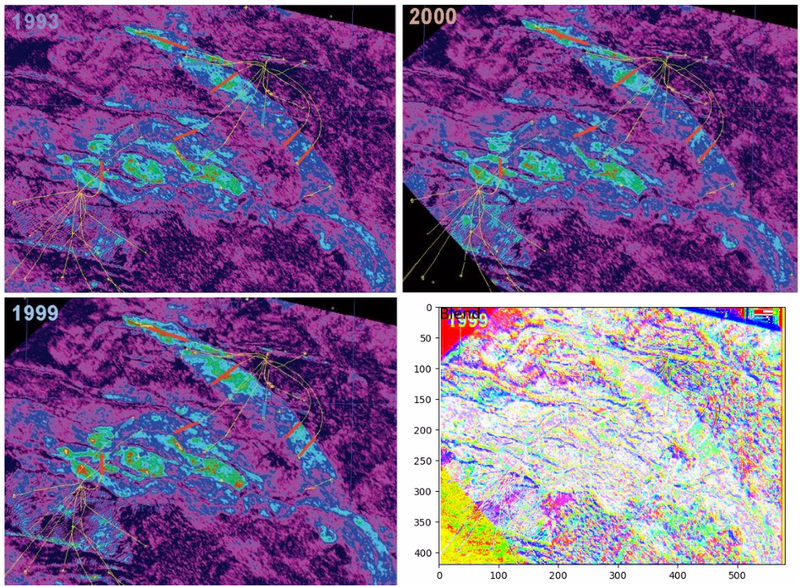 Similarity attribute Displayed using a Greyscale Colourbar (left). Bump mapping of similarity attribute using a lightsource positioned at azimuth 350 degrees, inclination 20 degrees. The technique is called hill-shading. The terrain doesn't have to be a physical surface; it can be a slice. And unlike physical bumps, we're not actually making a new surface with relief, we are merely modifying the surface's luminance from an artificial light source. The result is a more pronounced texture. Constructing this display takes a bit of trial an error. It wasn't immediately clear where to position the light source to get the most pronounced view. Furthermore, the amplitude extraction looked quite noisy, so I softened it a little bit using a Gaussian filter. Plus, I wanted to show only the brightest of the bright spots, so that all took a bit of fiddling. Even though 3D data visualization is relatively common, my assertion is that it is much harder to get 3D visualization right, than for 2D. Looking at the 3 colour-bars that I've placed in the legend. I'm reminded of this difficulty of adding a third dimension; it's much harder to produce a colour-cube in the legend than a series of colour-bars. Maybe the best we can achieve is a colour-square like last time, with a colour-bar for the overlay on the side. 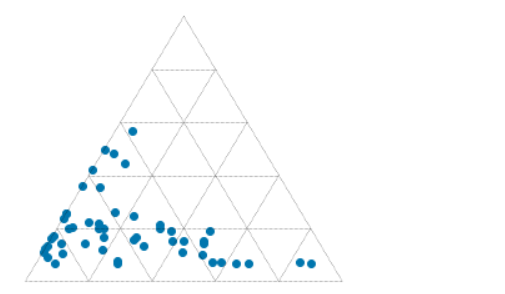 Check out the IPython notebook for the code used to create these figures. A story from the past that is believed by many people but cannot be proved to be true. An explanatory list of the symbols on a map or chart. An explanatory list from the past that is believed by many to be useful but which cannot be proved to be. Maybe that goes too far, sometimes you need a legend. But often, very often, you don't. At the very least, you should always try hard to make the legend irrelevant. Why, and how, can you do this? On the right is a non-scientific caricature of a figure from a paper I just finished reviewing for Geophysics. I won't give any more details because I don't want to pick on it unduly — lots of authors make the same mistakes. Here are some of the things I think are confusing about this figure, detracting from the science in the paper. Making the reader cross-reference the line decoration with the legend makes it harder to make the comparison you're asking them to make. Just label the lines directly. Using unhelpful, generic names like 1, 2, and 3 for the models leads the reader into cross-reference Inception. The models were shown and explained on the previous page. Inception again: the models 1, 2, and 3 were shown in the previous figure parts (a), (b), and (c) respectively. So I had to cross-reference deeper still to really find out about them. The paper used colour elsewhere, so the use of black and white line decoration here seems unnecessary. There are other ways to ensure clarity if the paper is photocopied. Everything on the same visual plane, so to speak, so the chart cannot take any more detail, such as gridlines. I have tried to fix some of this in the version of the figure shown here. It's the same size as the original. The legend, such as it is, is now a visual key to the models. Careful juxtaposition of figures could obviate the need even for this extra key. The idea would be to use the colours and names of the models in every figure, to link them more intuitively. Reduce the fatigue of reading by labeling things directly. Avoid using 'a' and 'b' or other generic names. Call the parts before and after, or 8 ms gate and 16 ms gate. Put things you want people to compare next to each other: models with data, output with input, etc. Use less ink for decoration, more ink for data. Gently direct the reader's attention. I'm sure there are other improvements we could make. Do you have any tips to share for making better figures? Leave them in the comments. Some great comments came in today, and the point about black and white is well taken. Indeed, our 52 Things books are all black and white, and I end up transforming most images and figures to (I hope) make them clearer without colour. Here's how I'd do this figure in black and white.